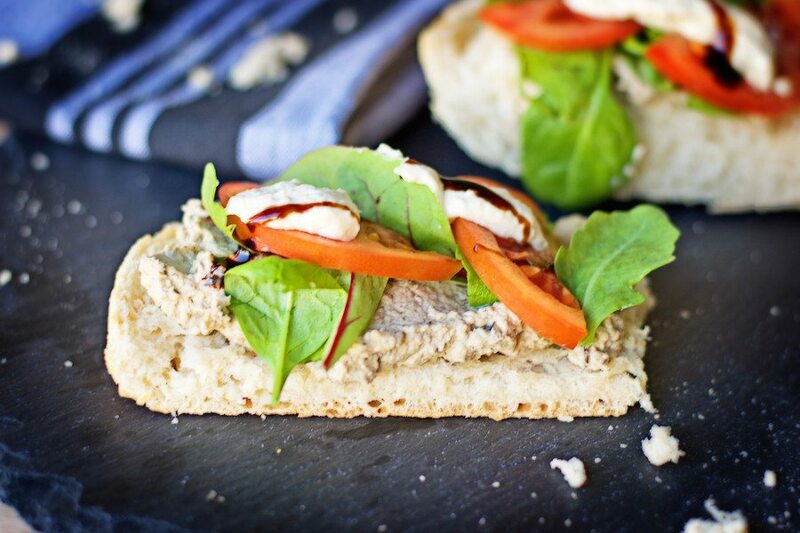 Baba Ghanoush Crostini with Vegan Aioli – very vegan, very delicious! Hello my lovely food enthusiasts! 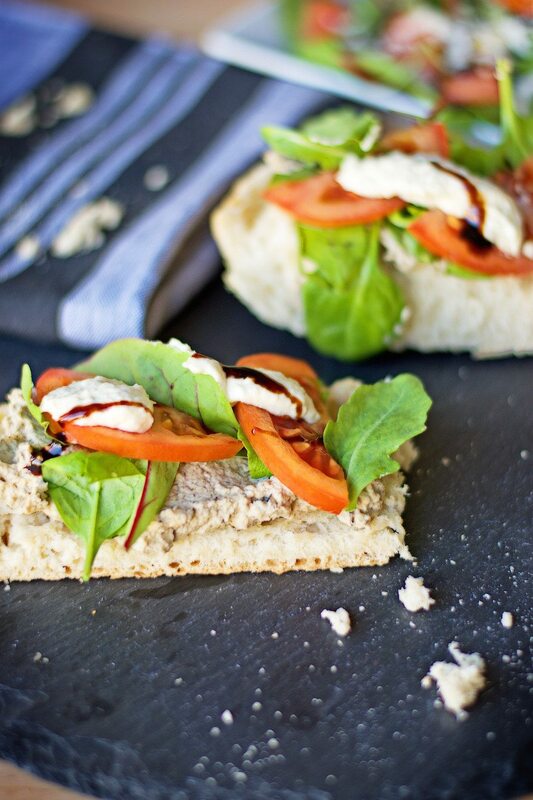 This time we head to my wonderful recipe for the Baba Ghanoush Crostini with Vegan Aioli. Baba Ghanoush is originally a middle east spread made from eggplants, tahini, sesame paste, garlic, lemon juice – full of flavor awesomeness. The traditional preparation apparently includes roasting the eggplant over open fire so that the inner flesh, which is used for the spread, get soft and smoky. I decided to take an easier option by simply baking the eggplant in the oven. Overall, this recipe is pretty easy. Here, I use the Baba Ghanoush as a spread on sliced baguette. A green salad and tomato topping is then crowned by a spoonful of my vegan aioli. This is also a very nice dip. Instead of mayonnaise as a base, I use soaked cashew and pine nuts! Very delicious, very vegan – go check it out! Preheat oven to 390°F (200°C), prepare a baking sheet with parchment paper. Roast eggplant for about 30 minutes, let cool a bit for 5 minutes. Then add the eggplant, tahini, garlic, agave, water, citrus juice, and cider to a food processor or blender and process until smooth. Start making the aioli by combining the soaked nuts without the liquid, oil, garlic, and maple. Season with salt and process until you have a smooth and creamy thick paste like mayonnaise. 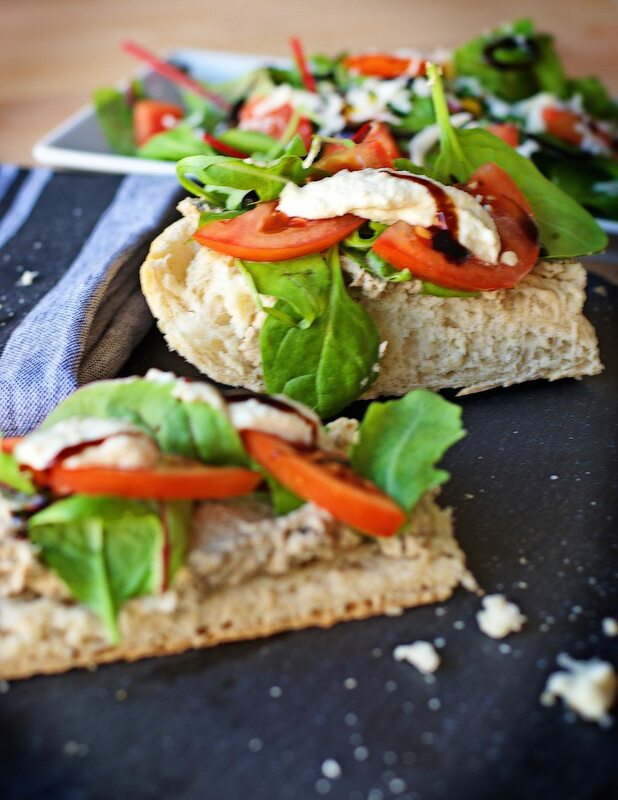 To assemble: spread the Baba Ghanoush on the baguette, add arugula and tomatoes. Top with the aioli. Enjoy! Sounds wonderful, and while I’m not vegan, your aioli sounds delicious and something I would try! I hope you do, Judy! Let me know how it turns out! Thank you, Kristen! I hope you try it! I love baba ghanoush and the vegan aioli is a great idea! Such a great idea to put baba on bread for an appetizer! Love this! Glad you like it, Julia! Florian, I am the furthest thing from a vegan, but dishes like the one you’ve created here outright tempt me. Great job.